Brussels-Sofia return. 5 hrs delay old and dirty airplane. Poor service and legroom. Never again and will choose an airline where I have to make stops to bring me to Sofia. Booked Bulgaria Air Moscow - Bourgas - Moscow for our family vacation. First they cancelled all Sunday flights so we had to fly out on Friday - we learned about it on Friday. The times were changed too. From comfortable 7pm from Moscow and 2pm to Moscow to 3am from Moscow and about 8pm to Moscow arriving at about midnight. And we are traveling with three kids. Bulgaria Air seems to be in business of causing inconvenience for this was a small one comparing to what was awaiting on our way back. They routed the flight from Bourgas to Moscow through Sofia. I thought this was not such a big deal especially when I saw that there would be just 50 minutes between the flights. However they made all of us go through the whole procedure: - claim our luggage; - check-in; and even - passport control. We had to go through security check on our way to the plane and some of the passengers had already opened their Duty Free bags from Bourgas Duty Free. When they asked what were they supposed to do now the answer was Put it in your luggage.It was quite a sight to see these poor fellows rushing back to check-in stands and asking for their luggage back. The check-in clerks had no way to claim it back - or so they said. We thought the airline would provide us with a meal since they extended the time of our flight from 2.5 to 6 hours. There was a cold sandwich and a cup of juice. That's it for a six-hour journey. The kids on the plane were going crazy - overtired hungry just exhausted. Nobody in Bulgaria Air cared enough to reserve the front seats for passengers with kids though this is a common practice for all major charter providers. All the way we were treated like a heard of sheep not like customers. 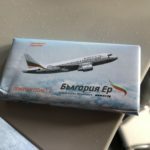 As one passenger on this forum put it customer service is an alien concept for Bulgaria Air. Frankfurt to Sofia return. The ground staff in Frankfurt and Sofia were very helpful and gave us the seats we requested. The flight to Sofia was a smaller plane and unmarked but it was clean and comfortable. We received a sandwich and dessert and drink selection offered was good. On return we flew a 737 and the leg room was very tight but luckily it was not a full flight and we were able to move around. We had a packed lunch with sandwich and cake and the same nice selection of drinks. The crew seemed courteous and responsive to requests. We left and arrived on time and we had no baggage problems on either end. All in all it was a good experience and I would fly Bulgarian Air again. This is a ridiculous airline very badly run! I flew them BFS-SOF-BFS in February and it was the most horrible flight I have ever been on. The space between the seats is nothing and I sat the 3+ hour flight with my knees jammed to the seat in front. The flight attendants were rude and kept obsessing over the stupid curtain between business and economy (there was no difference on this flight as it was a charter) and only did half the safety briefing on the outbound. The heat on the plane was unbearable and any time you asked for a drink of water the flight attendants would acknowledge your request but made no effort at all to fulfil it. Another person in my group went to the galley himself to get a drink after having asked the flight attendants several times. The flight attendants could barely crack a smile and they only time they spoke was to give an unenthusiastic hello as we were boarding or to stand in the aisle and wave their hands about while complaining about the amount of children in the aisle. The plane had no Bulgaria Air titles on it or anything to suggest that it was the country's national airline. While it was a new A320 and very quiet I found the seat layout ridiculous. Just back from a skiing holiday in Bulgaria flew with Bulgaria Air. Very bad experience. Cabin crew were the grumpiest I have ever experienced - did not smile once during the whole flight. The plane was extremely old and had no logo on it at all. No room in seats completely squashed. On the return flight to Belfast I found a three foot long piece of plastic lying on the ground under my feet! Take off and landing extremely poor - never again.. Felt unsafe during the whole flight cabin crew have no english. Sofia-Varna return. I was a little concerned about this flight after reading some of the comments but I had a positive experience. Both flights on time airliner was an Avro 146 which is OK for a 40 minute hop. Cabin crew friendly and with good english skills. On the contrary ground crew at both airports barely said "hello" to me and looked very bored. Sofia-Heathrow return. 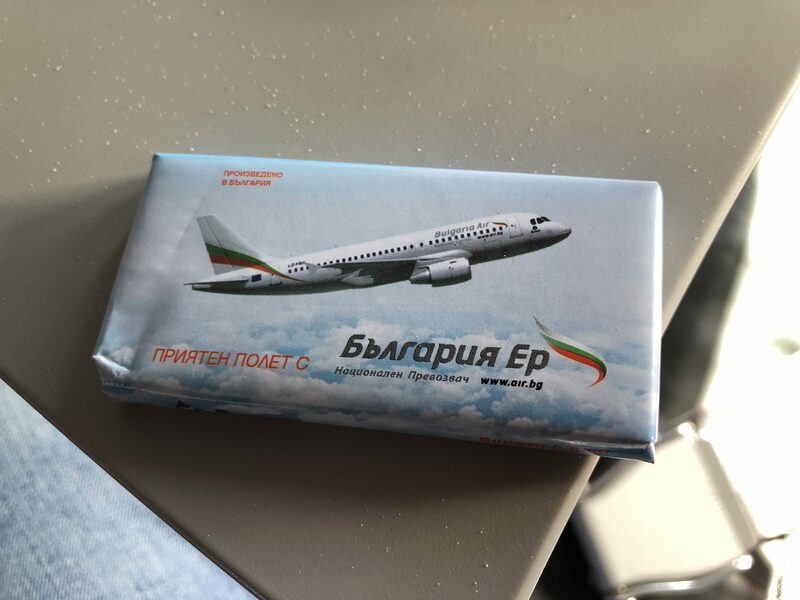 It's a matter of luck with Bulgaria Air. My flights were fine and the cabin crew pleasant. Food - small ham and cheese sandwich and a small cake and it's free. Drinks free and a good selection. My only complaint is not enough leg room. Sadly when my family flew Sofia-Heathrow a few weeks later things were different. They found a half-chewed sandwich in the seat pocket with a lump of chewing-gum on top! When they showed it to the attendant she remarked "Dirty English passengers from previous flight"! My family also complained about leg-room and stale food. So as I say it's a matter of luck. However I will use them again if the fare is competitive. SOF-Varna return in Business Class (operated by Hamus International Airlines). At SOF airport separate Business Class Security Check. Very nice lounge from where Business Class passengers are picked up and delivered to aircraft. Older AVRO Jet inside completely coloured with white paint. Very wide seats (mechanics a bit worn out) spacious leg room. Drink and Snack offered on 50 minutes flight. Very attentive and friendly staff. Present (bottle of wine and some cosmetics) on departure. A very good experience at € 230 for both ways in Business class! LHR-SOF My first flight on this airline chosen for price and convenience (dep LHR at 6pm). Check-in quick (no queues) and reasonably friendly (handling agent is Alitalia). Boarding by seat row smooth and efficient. Seat pitch not great but in my opinion no worse than on most other airlines these days. Friendly PAs. Departure and arrival were both on time. Rather long wait for luggage at SOF. LGW - Varna. This airline seems to have improved since I last flew with them a year ago. Fairly modern A320 plane (although completely unlabelled as Bulgaria Air as others here note) left and arrived on time staff friendly and efficient and snack/drinks ok (free after all! ).